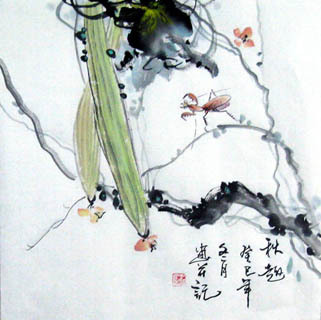 Chinese insects paintings include butterfly, bee, grasshopper, cicada, beetle, toad and frog paintings etc. They are not only an ornamental addition, but also have auspicious meanings. 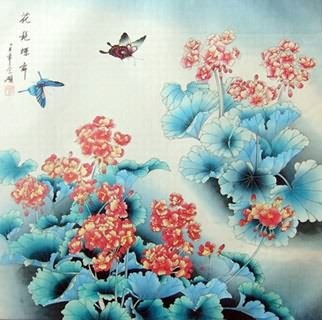 Chinese Butterfly Painting: Butterfly is a symbol of eternity. 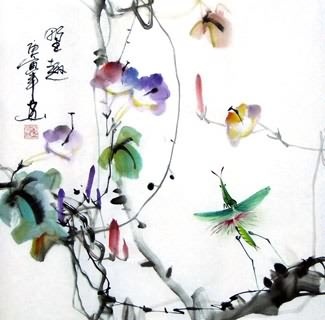 Butterfly over flowers represent sweet love and perfect marriage. 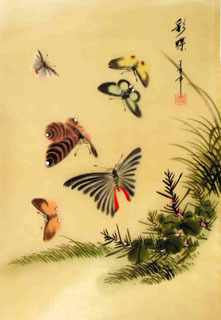 Butterfly can be combined with many other subjects and constitute auspicious paintings. 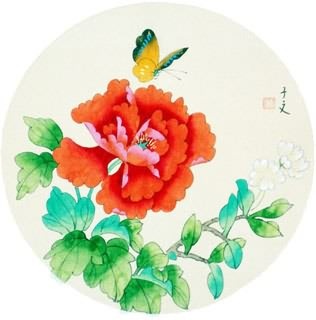 Gua Die Mian Mian(瓜瓞绵绵): Luffa and butterfly. Luffa is very small when it is just growing, and then much bigger. 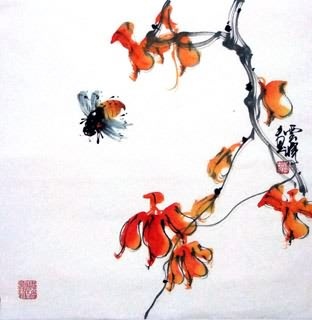 The second Chinese character of butterfly is "die( 蝶)" which sounds the same as that of "small melon(瓞)". 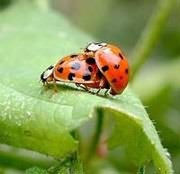 So this combination symbolizes prolific offspring. 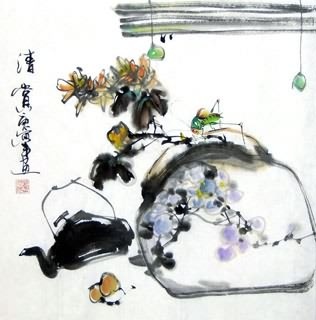 Shou Ju Mao Die(寿居耄耋): Stone, chrysanthemum , butterfly and cat. Stone symbolizes longevity; "chrysanthemum(菊)" sounds like the word "residence" or "be (in a certain condition)" (居). "Cat(猫)" and "buttefly(蝶)" sound like that of "octogenarian(耄耋)" in Chinese. So the whole combination means longevity. 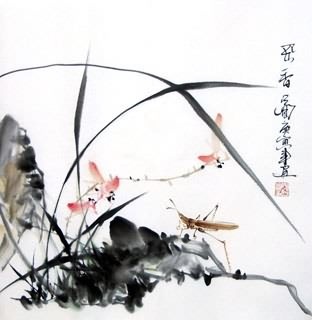 Chinese Grasshopper Fengshui Painting: In Chinese, "grasshopper(蝈)" sounds like the word "officer(官)", so it symbolizes public office. 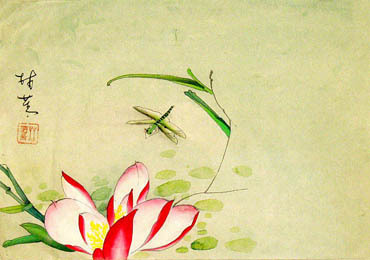 The grasshopper on the chrysanthemum is called "Guan Ju Yi Pin( 官居一品)". As "chrysanthemum(菊)" sounds like the word "residence" or "be (in a certain condition)" (居). "Yi Pin(一品)" means the first ranking official position in feudal China. And grasshopper is good at jumping, so it implied "getting promotion soon". In feudal China, this combination symbolized high rank and salary. 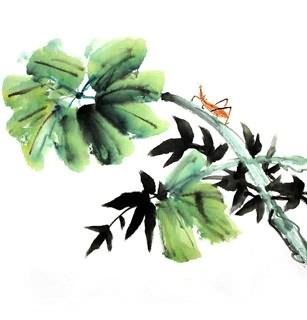 Chinese Mantis & Pumpkins Feng Shui Painting: Mantis: The mantis represents vitality and flourish. Besides, mantis is called "tang lang( 螳螂)" in Chinese. 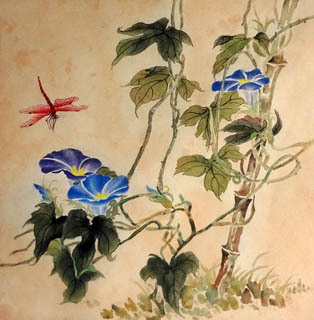 The first character "tang" is a homonym of the word meaning the "堂 (main room of a house)", and the second character "lang" sounds the same as "郎(young man)", so the mantis in the painting expresses the hope for a lot of children in the family. 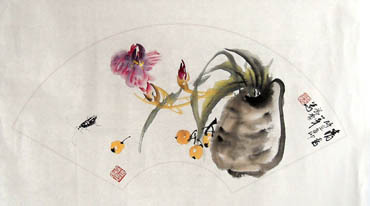 The combination of two pumpkins and a mantis is called "Jia He Wan Shi Xing(家和万事兴)". Two pumpkins represents the brothers or a couple living in harmony. So this combination suggests "A happy family means wealth and will prosper". A basketful of lychees and a mantis Painting . 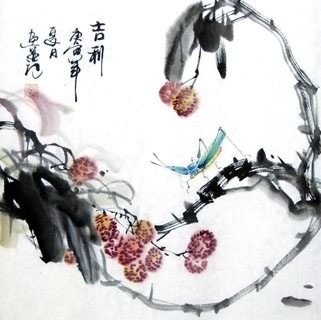 Lychee is called "li zhi(荔枝)" in Chinese, the first character is "li(荔)" which is sounds the same as that of the word "profit( 利)", and that of the second sounds like that of "子(child)". So this combination implies huge benefit and many children. 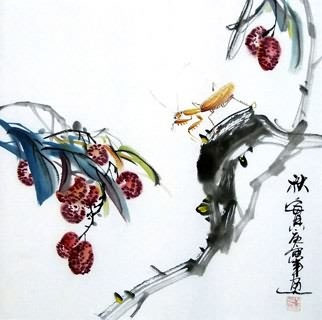 Chinese Cicada Fengshui Painting: Cicada is a symbol of regeneration. Cicada also symbolizes "clever" and "surprise the people with one's first success". In feudal China, people believed that the child who carried a jade cicada would get great progress on his study. 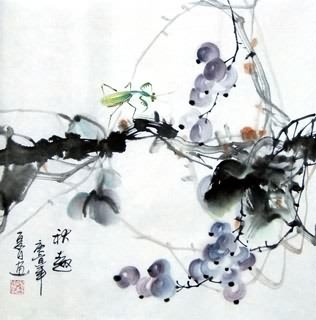 Chinese Beetle Fengshui Painting: Beetle is called "jia ke chong(甲壳虫)" in Chinese, which includes the character "jia(甲)". It means the first. 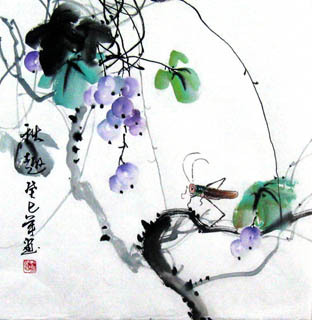 So beetle painting suggests a Chinese phrase "fu jia tian xia(富甲天下 )" which means "the richest in the world". 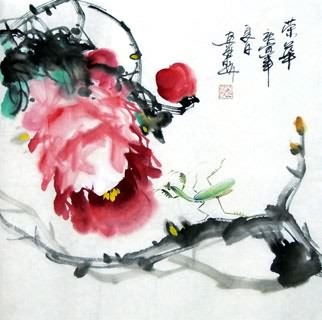 Chinese Frog Feng Shui Painting: Frog: in ancient China, people believed that frog had the function of exorcising evil spirits and protecting their residences. In Chinese, frog(蛙) sounds like the word "child( 娃)", so two frogs on the lotus leaf are called "lian sheng gui zi(连生贵子)", which implies a prosperous family. 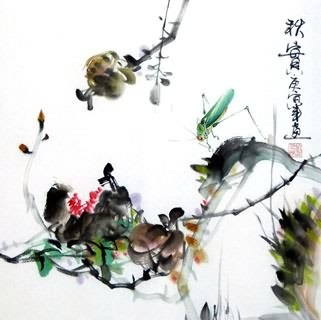 Chinese Toad Feng Shui Painting: Toad: it can bring in wealth and treasure. In feudal China, the toad with three legs was called "gold toad" which could spit coins. 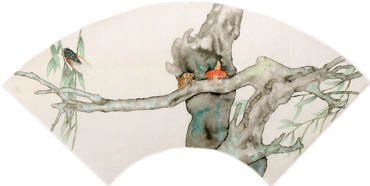 The painting "Liu hai playing with toad" symbolizes "make money step by step". InkDance Price: USD 320 /GBP 263 /EUR 304 Sold, you can customize it.